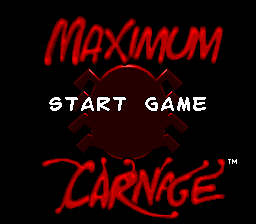 Spider-Man and Venom: Maximum Carnage, or simply Maximum Carnage (マキシマムカーネイジ) is a beat-'em-up game based on the Spider-Man universe. It was released for the Sega Mega Drive in 1994. Sega Master System and Game Gear versions were planned, but never released. This is one of the rarest Mega Drive games in Japan along with Acclaim's WWF Raw. Rather than roll out a line of exclusive Japanese packaging, Acclaim opted for giving the Japanese European packaging with very minor changes. As a result, this is the only game in the Mega Drive's official library to have the same product code across all regions (internally the game's code is T-81256-50 in Europe/Japan but the packaging says otherwise). Strangely, while the game's packaging features the Acclaim name and logo, the game itself has the logo and name of LJN instead, who released the SNES version, and until the release of Spirit of Speed 1937, was the only game on a Sega platform to feature LJN. Main article: Spider-Man and Venom: Maximum Carnage/Magazine articles. Main article: Spider-Man and Venom: Maximum Carnage/Promotional material.